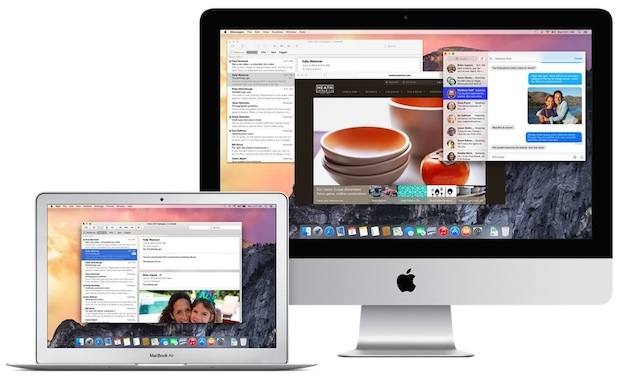 Apple has released the fifth beta version of OS X 10.10.2 for users registered with the Mac Developer program. The new Yosemite build is 14C99D and continues to emphasize a focus on addressing bugs and remaining issues with wireless networking, Mail, and VoiceOver. Mac users who are part of the Developer Program can find the latest build available in the Dev Center or through the Mac App Store. The new build is also being pushed to Public Beta testers of OS X Yosemite as well, assuming they have not opted out of receiving the beta releases from the App Store. With a renewed beta being available for testing just a week after the prior beta release, OS X 10.10.2 will likely be made available to the wider public sometime in the coming weeks. The most recent public version of OS X available for Mac users remains 10.10.1, which has not successfully resolved persistent wi-fi problems for some individuals running OS X Yosemite. Does this actually fix wi-fi? Does it fix the constant never ending Mail send failures? Does it fix the Spotlight security leaks? Does it fix Bluetooth failures? Does it fix Bluetooth interfering with Wi-Fi? Does it fix AirDrop? Does this fix the inability to connect to Windows and Samba networks? Does this fix the inability for OS X Mavericks to network with OS X Yosemite at any level that would be considered acceptable in a public release of software? Does this fix the blurred fonts antialiasing problem? Does this fix the tiny font that makes your eyes hurt? Does it add a bold font option? Does it make the font black rather than cloud gray? Does it fix the maximize button so that it works like you think it would work and not Full Screen which nobody wants? No? Oh, that’s too bad, I guess I will stay on OS X Mavericks 10.9.5 it is. I suspect OS X 10.10.3 or OS X 10.10.5 will not be good enough either, just more wi-fi fixes that don’t work, perhaps OS X 10.11 will work? Maybe they can release OS X 10.9.6 as OS X 10.11? We can dream that these $2500 computers will work as advertised, or as they did before updating to this terrible operating system named after one of the most beautiful places on Earth, what a shame on the name. Yea you can probably tell I am fed up with Apple about this OS X Yosemite release, I am ready for something that WORKS! Oh yea don’t get Apple to fix the bugs on our $3500 computers, just install Windows on your Mac. Good idea Ellie! What a ridiculous suggestion. Ultimate Stockholm syndrome of a typical OS X Yosemite user, abused by the bugs and loving every minute of it. Oh, you don’t like your bugs? These bugs are features, they’re the best bugs ever! These bugs are going to amaze you, these bugs just work. You don’t like the worst release of OS X ever dumped on the public since 10.0?? Then install Windows! Hard to believe there are people out there who defend OS X Yosemite. Here’s a big HINT that Yosemite is a turd; why would Apple be frantically working on OS X 10.10.2 to address THE SAME BUGS that were NOT RESOLVED in OS X 10.10.1 and that shipped with OS X 10.10 if it was not a complete pile of crud? Think about that one, Yosemite apologists. Wow, did you just completely confirm you’re a complete moron that cannot detect sarcasm. Back to your useless ranting. Mavericks works fine and I’m not missing out by going across to Yosemite just yet…Apple you can’t afford to lose customers here in Australia! I was also part of the Yosemite Public Beta, filed probably 30 bug reports, all of which went ignored and the problems still persist now in OS X. The Public Beta was clearly just a PR thing, they didn’t listen at all, our bug reports probably went straight into the trash can. I agree with you! I first thought that Public Beta will make a better product as more people that report the bugs, but clearly they did not want to listen at all our bug reports. They are so slow at Apple. For example, a street near me was not written correctly. I submitted 4 reports and took more than a year to get it fixed in Maps. I submitted a report for Google Maps and it was fixed in 5 days. Here’s a company who really care about reading reports. I agree with virtually everything you said. With regard to the maximise button tho, have you tried holding option whilst clicking it? What a whiner you are. Get a Commodore 64 and call it a day. I have spent somewhere north of $30,000 on Apple kit in my usage history, so I think I have the right to be annoyed when a software update tanks my expensive Mac hardware and renders it nearly useless. If you’re not annoyed with the problems of OS X Yosemite, you’re probably not doing any serious work on the computer. I’m sure it works fine to stare at Facebook, assuming you can get online and past the endless wi-fi problems, anyway. Spending money on Apple products entitles you to nothing, thinking anything else is a fallacy. Doesn’t matter if you buy Apple or Snake Oil. Get over your entitlement. Only a complete iSheep simpleton would give Apple $27,000 of pure profit on $30,000 of purchase. iSheep. Considering I’ve had absolutely ZERO problems with Yosemite (including WiFi) on several Macs it’s installed on; do you think it’s possible that in most all cases, PEBKAC? I’e been trying to find out just what this beta is supposed to fix… Wi-Fi does seem more reliable (better than iOS 8 anyway) and Air-Drop seems to be working well, where before it was certainly a ‘sometimes’ thing. Thank you very much for your post. I share exactly the same perspectives with respect to fonts, and hope they can give at least an option to make fonts darker black rather than gray, or bolder (not complete bold) option.Font is the important issue for prestigious eyes. I get failed to download messages when trying to download many of the books I have purchased in ibooks. 5.) Choosing ‘Replace’ to keep the same name. I now get a new file that is 10% to 15% it’s original size without any loss of size, pixels etc. What on earth does this have to do with OS X Yosemite 10.10.2? Classic Prabhat, classic. ImageOptim is a great little app that reduces image size. Totally irrelevant to the thread, though. I haven’t experiences any of the WiFi / Mail / Bluetooth etc issues is Yosemite, but find the whole thing ‘feels’ sluggish compared to Mavericks. Hoping for a ‘general’ performance upgrade. 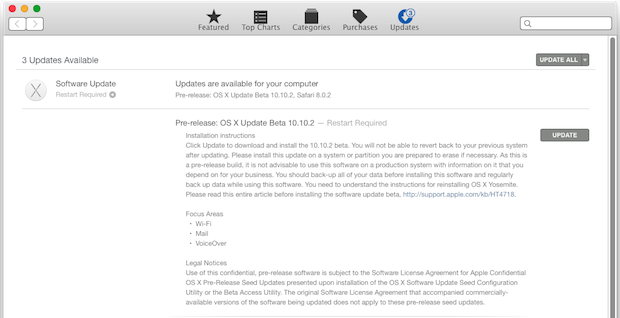 OS X 10.10.1, an operating system I was eager to see the release of. WWDC and several reviews had suggested that Yosemite was not only a nice operating system, but more stable than other operating systems. I’m not denying that it’s not stable, but it doesn’t feel finished either. I like the look of Yosemite and the improved Notifications Centre that resembles much of the look of iOS 8 which I liked, but there is some things that could do with appending in an important update. After the initial release of Yosemite and when more users adopted the new release, all the current critic reviews at the time were almost irrelevant. Although I did not have a Mac on hand at the time of the release of Yosemite, I sure read a large amount of reviews that suggested strongly that it had Wireless problems. They weren’t kidding either. I”m using Yosemite on a Mid 2009 MacBook Air 2009 and the only way to connect (without the USB LAN adapter) is via the Wi-Fi. The Wi-Fi I find drops quite often and actually dropped when I wrote my first comment on here so I lost that! I know the wireless at my school isn’t particularly reliable, but this happens at home as well when the wireless connection is reliable. I’m not entirely sure if this happens in Mavericks because I wanted to go straight to Yosemite. I’m told Mavericks doesn’t do that, which is strange. if that is the case, what did they break in Yosemite that wasn’t broken in Mavericks? Despite the fact Apple need to rationally improve hardware compatibility, I am willing to see this operating system through until the point of end. Hopefully, as I remain in Yosemite I will witness the improvement all us Yosemite users need. Hopefully, Apple has fixed their Mail app so the Address Book/Contact Icon shows up in the tool bar and we will no longer have to address emails to multiple recipients one at a time or use a workaround. That was a bad move Apple. Don’t know what you were thinking! Mail is super dumb down, they don’t show “Smart Addresses” or senders when using mail lists either. Welcome to iPhone! Whenever you post something about Yosemite, you should disable comments as all the cry babies show up whining that this is broken and that is broken. It works fine for the masses and the same few whiners on here really bring down the karma for Yosemite. All these Debbie Downers, should go complain on the Apple forums and start voting with their wallets and stop buying Apple stuff. Most probably just need to learn how to use a Mac. There is an unusually large volume of complaints with various aspects of OS X Yosemite, usually pertaining to bugs, crashes, networking, interface and font issues, email, amongst other problems that users did not have prior to updating. For what it’s worth, I have experienced some of these issues myself on some specific Macs, so I do think the desire for an update to resolve many of the difficulties is warranted. How much do you get paid for posting this nonsense without real arguments? Did you mean by “learn to use a Mac”: try to avoid the bugs and broken features, and when everything goes wrong, just shut up and get yourself a C64? I have no clue what all these problems are. I don’t seem to have any problems. Everything runs like it used to —-last month, last year and the year before. I have a friend who took her computer back to the Apple Store to have them reverse Yosemite back to Maverick because she “didn’t like Yosemite”. First I asked her why didn’t she just go click, click, click and do it herself and then I asked her what she didn’t like about it. As you can guess I never got a straight answer. I have come to the conclusion that most Mac users know virtually nothing about computers. They just believe that everything should be perfect in their imagination. They just believe that everything should at least work like it supposed to. Too much to ask when you paid $3000 for an iMac? It has nothing to do with acknowledge: video issues, wifi issues and other problems aren’t and shouldn’t be related to the user. I was forced to “downgrade” to Maverick, and the fact that your system is working great and messing up on so many other setups is showing how arbitrary this new OS actually is. Haters hate the OS, fans hate the haters… just stupid. When I upgraded to Yosemite, I started having display issues, as in a totally black screen. Computer would work in the background, i.e. iTunes or video would be audible and I could quit programs with cmd-Q, but black screen. An outboard display worked fine. I reformatted and installed OS 10.8 and the problem is gone. I will give it a while and back up my data, then try Mavericks. My iMac is well within the parameters for Yosemite and clearly it is not my hardware, at least in a conventional sense. OS X Mountain Lion is stable and works, and OS X Mavericks is generally quite good too, so long as both versions are updated to the latest available point release these are more than fine. OS X Yosemite has been very problematic for a lot of users, if you have problems with Yosemite and have work to do without the lots of time to fiddle with clean installs and general troubleshooting, simply migrating back to a prior release of OS X is the easiest way to get back to work. I am running OS X 10.9.5 for a reason, I need my computer to be reliable so I can work. Frankly, if I wanted to fiddydaddle with kexts, plists, third party hacks, and have a hassle with everything, I’d run desktop Linux. OS X Yosemite is a very sloppy release from Apple. Even the 10.10.2 betas are full of bugs, unless beta 6 is the magic miracle, even OS X 10.10.2 is unlikely to resolve the problems and so maybe OS X 10.10.3 or OS X 10.10.4 will be ready for prime time. A family member recently spent 4 hours on the phone with AppleCare and a brand new MacBook Air trying to troubleshoot a huge array of Yosemite problems with 10.10.1, so surely Apple is well aware of the problems. I agree with everyone, who hates Yosemite (the system not the park :D), especially the WiFi problems. You should just be aware, that Windows 8 wasn’t better at its shipping days. The first six months were characterized by Update problems (around 150 of 180 updates failed). New operating systems are always a mess, and since Steve is dead, Apple get’s nothing on the row. iOS 7 was a catastrophe as well as iOS 8 is. Mavericks wasn’t by far as good as Mountain Lion, and the biggest fail is Yosemite. A while it’s true that in OS X 10.10.5 will not be good enough (especially because of WiFi, Mail and Finder), I was able to solve a lot of problems with a clean install (except WiFi). Maybe you should consider this and think of taking the time to perform a clean install rather than wait for Apple to fix, because as seen, you’ll wait for a long long time. By the way, the WiFi Problems especially with PEAP encryptions aren’t solved even in 14C99d. Its not a new OS, its version 10.
days all work fine: Wi-Fi OK – Mail OK.
Hope Spotlight will fix correctly mail (smartboxes, VIP, today, search … ). Very critical issue. Other way, no need to use Mail any more !!! Just to be clear: I love Yosemite when it works, which it does on my work Mac. On my home Mac, it basically wreaks havoc. wow, I am not having any problem with my machines right now, I got three mac computers (mac book retina 13′, iMac and mac mini), I am not facing any problems above mentioned, I used to experience wifi problem with my mac book pro when Yosemite released but it looks like everything fixed now. I use airport express . hopefully apple acknowledge your problems and fix them soon. It’s very annoying that once used to be good operating system now becoming frustration with newer updates. I hope they allow fonts THICKER, font_weight needs to be thicker, stop this madness of thin fonts, even websites are adopting now and to make is readable they have to make zoom, look at the cnn.com. People are sometimes nuts.Just for the sake of aesthetics they do crucial mistakes like fonts settings. Fonts should be set “regular”, dont play with the settings. Using zoom or 150% dpi wont help, it will look large, will improve a bit but still look thin. Fonts are not top models, they should be set for us to better read and write. Microsoft brought this madness with win 7. XP was easier to read. Any they borrow each other’s bad habits. Like all PCs now borrowed bad keyboard due to macbook air. Also make the darkness level as dark black, do not make it gray. Background is also gray, so contrast is lost, hard to read. Do you remember painting class 101 about contrast to bring the main object upfront?